Duke was born in Winterset, IA in the year 2333. At the age of eighteen he left for Starfleet Academy against the wishes of both his parents. He majored in Security with a minor in command hoping to one day command his own ship. His first assignment was on board the Ambassador class USS Excalibur as a junior security officer. 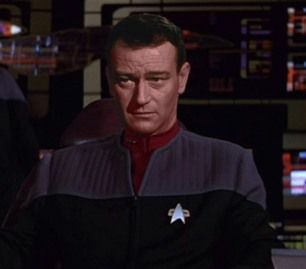 It barely took him three years to rise from Ensign to full Lieutenant and in 2363 he was reassigned to the USS Crockett as Assistant Security Chief. His next assignment was on the USS Venture where he served as Security Chief for eleven years doubling as Second Officer for six of those. While the Venture was not one of the ships that served on the front lines of the War Duke was one of those promoted after the war assuming the role as First Officer on the Cheyenne class Corinth. He served on the Corinth for almost four years before electing to take the Planck assignment to explore the Delta Quadrant. After the arrival of the USS Discovery he was on the short list to assume command but he requested he not be considered since he was uninterested in commanding Discovery citing it was not a good fit for him.